"Never work with animals, children...or electronic equipment" I wrote in my last post. I have to tell you, dear blog reader, that this turns out to have been something close to a prophetic statement. I arrived a little late, but having swallowed one of my magic little pills (prescribed by my very kindly doctor for such emergencies AKA book-induced-public-reading-trauma) I was the picture of calm. 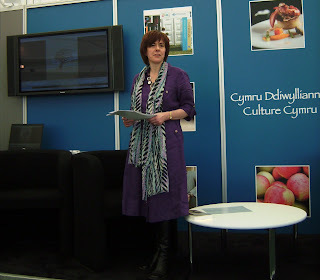 Penny Thomas, my attentive and very kind editor, dropped me by the entrance, and after a quick excursion into the 'artists' marquee found an assistant to direct me to the 'Culture Cymru' tent. It was a magnificent structure - a miracle of space and light - but, unfortunately, unsuitable for illustrated talks which require a large screen, darkness and some sort of audiovisual apparatus. There was a plasma screen (the size of a large domestic TV) and a computer attached, but facing this was a wall of glass so the screen was invisible except to those quite close. There was no microphone, and the only speakers were those built into the set. It's a bit of a blur now, but I was pleased to meet Simon Hicks and Vicky Humphreys from Seren, Lorraine, Simon's wife, and Imogen, another writer. Since there was little time to spare I unplugged the pc attached to the TV and plugged in my Mac. I stood back. The pinky-purple starscape indicated the plasma screen was seeing my Mac, but my desktop wasn't appearing. I restarted screen and computer but nothing happened. 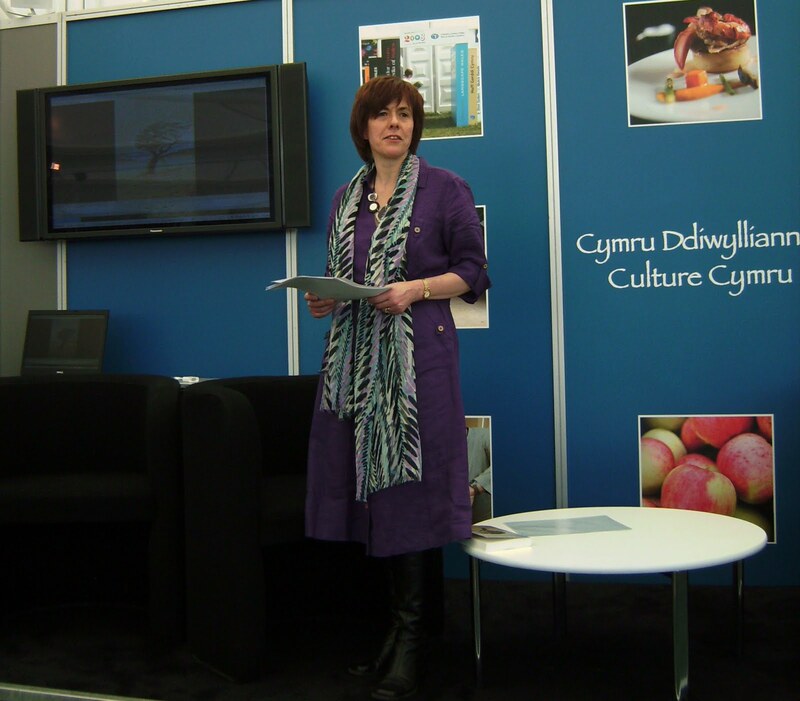 I had been warned by someone from the Welsh Assembly that there would be no technical support (which seems to me to be a great shame) but luckily there was Linda Thomas from the Welsh Assembly. This woman is now my hero. We tried inserting the DVD of my movies (which worked very well on our home DVD player) but this too failed to work on this pc. We then inserted my movies in quicktime. For some reason this pc refused to show them in anything other than editing mode, but since time was now running out we decided that this would have to do. By this time a few people had drifted in (including, incredibly, Rina, a friend from Chester Writers who just happened to be passing) lured into the marquee by my cup cakes which Vicky and Penny had taken out into the grassy quadrant. The audience was respectable ('more than half full' was how Penny put it, which I think is right) and after Penny introduced me I launched straight in aided and abetted by the aforementioned Linda. Since I have given a lot of talks now I am used to projecting my voice I could just about make myself heard above the creaking of the canvas and the voices of the crowd outside, and I expect a few people could make out the screen. There were some questions, and I finished earlier than I intended (my intention had been to repeat the films for people to drift in and out but given the conditions I decided to just leave it). The other events were excellent. I enjoyed meeting Tiffany Mirray and Paul Murray (not related), Owen Sheers and Russell Celyn Jones. In the queue to get my books signed for the latter two authors I started chatting to the man next to me and it turned out we'd met before too - he'd been in a reading group at Prestatyn to which I'd given a talk a couple of years ago - showing, once again that this book reading world is a small one. I also bumped into several people I knew which was fun including my former agent Natasha Fairweather and her daughter Georgia, my former foreign right agent Linda Shaughnessy, the talented Paul Blezard (who was interviewing the two Murrays, and who once interviewed me on the much lamented One Word Radio), the great Simon Singh, with his very charming wife and beautiful tiny son, and ended the day with my former editor Carole Welch (with whom I watched her protegé, David Mitchell answering questions on stage). So, as days go, it was one of the best. All the people I met were so kind to me that I went back to my bed and breakfast feeling very happy. 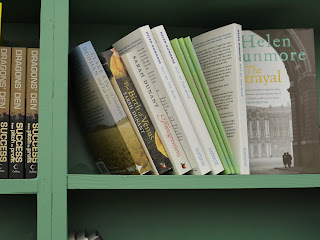 My book on Pemberton's bookshelves at Hay! Excellent report! Too bad about the electronics, after you'd worked so hard on the videos. Thanks Debra! Yes, it was a bit of a shame - I guess they just weren't expecting a big-gun movie-maker such as myself. Sorry to hear about the technological mishaps, but it sounds like it was an excellent festival. Surprisingly, even though Macs are so popular, I've been to innumerable conferences where there is no provision for audiovisual projection of Mac laptops, and no technical support for them. Great that you got a chance to chat with Simon Singh and his family. Yes, Paul I agree. It is strange that no one ever seems ready to accommodate Macs. With digital projectors I've found little problem - just the occasional flicking around of outputs - but with the TV it seemed intractable. I need to investigate this. it seems such a shame that an event with the profile of Hay is so limp in the tech department. I think is says something about the Two Cultures. you'd never have this problem at SF conventions, where the tech is run with military precision, being stuffed full of IT professionals. geek Is Good. An illustrated presentation, to my mind, is vastly superior to people just talking. But the problems I've had trying to get things going has often made me think of not bothering any more...but I shall persevere. It is worth it when things go right. Yes, I can imagine you'd be fine without AV, Cromercrox! You are a natural speaker, I'd say. I was thinking about a lightweight projector but when I last looked into it the LCD ones (only ones truly portable, I think) seemed to have poor customer reviews and insufficient brightness for much of a group. For a large group the only option, when I last looked at least, was for one of those conventional projectors with a horrendously expensive and fragile light bulb...and was still fairly expensive, even though the price was coming down. May be out of date though now! This technology is developing so quickly.